The most attractive new building on the Upper West Side in decades, this 25-story, 202-unit condominium building abounds in nice architectural touches. 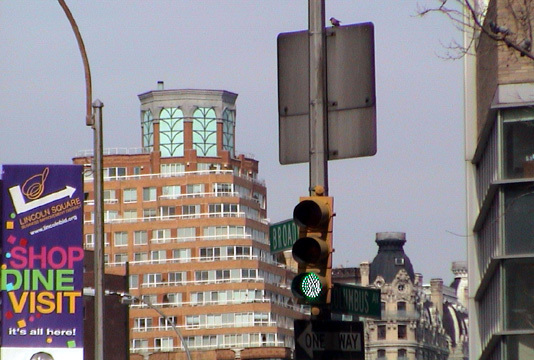 Its location on the northwest corner of Broadway at 72nd Street (in the lee of the taller Ansonia one block north) makes it highly visible from the south and its distinctive watertank enclosure is a wonderful Post-Modern concoction of Egyptian motifs. The façade of the building is richly colored in reds, whites and greens and sports very handsome white grill balcony railings. The apartment layouts are quite spacious and many of the units have very tall ceilings. While most other new buildings of the period have tried to be contextual (with strong urging from the city's zoning), this building, which was developed by Peter L. Malkin, Arthur G. Cohen and William Zeckendorf Jr. and partners and designed by Frank Williams & Associates and Skidmore, Owings & Merrill has gone the extra distance and been original. The building was completed in 1991 and is one of the best new buildings in the city in a decade. It replaces a two-story building that housed the Embassy movie theater and was formerly a site occupied by the Hotel St. Andrew. The building has a sundeck, a concierge, storage space, a health club and pool and laundry facilities every floor. In their fine book, "The A.I.A. 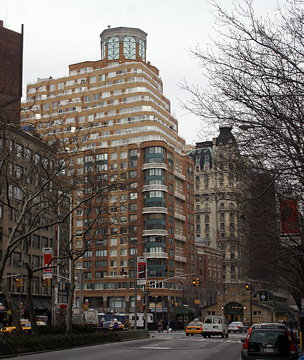 Guide to New York City Architecture, Fourth Edition," (Three Rivers Press, 2000), Elliot Willensky and Norval White wrote "Ramses II's mummy may return to blow up this insult to ancient Egypt. It took two distinguished firms to consummate this travesty." That comment is one of the very, very few in that book that is completely off the mark. This is an excellent project. Indeed, it may be one of the best Post-Modern buildings in the city. The balconies and enclosed rooftop watertank in particular are excellent. 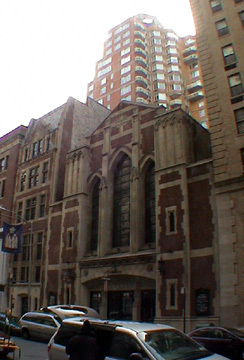 The building replaced a two-story building that housed the Embassy movie theater, that was designed by Peter Copland and Schwartz & Gross in 1938, and was formerly a site occupied by the Hotel St. Andrew that was designed by Andrew Craig in 1893. 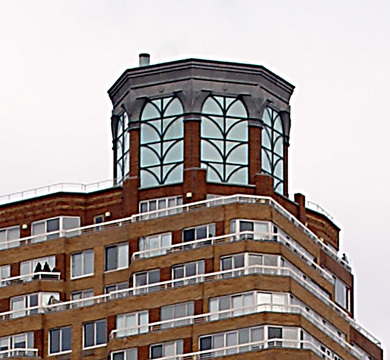 In their great book, "New York 2000, Architecture and Urbanism Between The Bicentennial and the Millennium," Robert A. M. Stern, David Fishman and Jacob Tilove described the Alexandria as "the most flamboyant of Broadway's new generation of apartment houses." They noted that developer William Zeckendorf Jr. had planned to expand the theater on the site "to become a 1,250-seat, five-screen complex, but the plan proved uneconomical when his attempt to assemble the full Broadway blockfront failed."